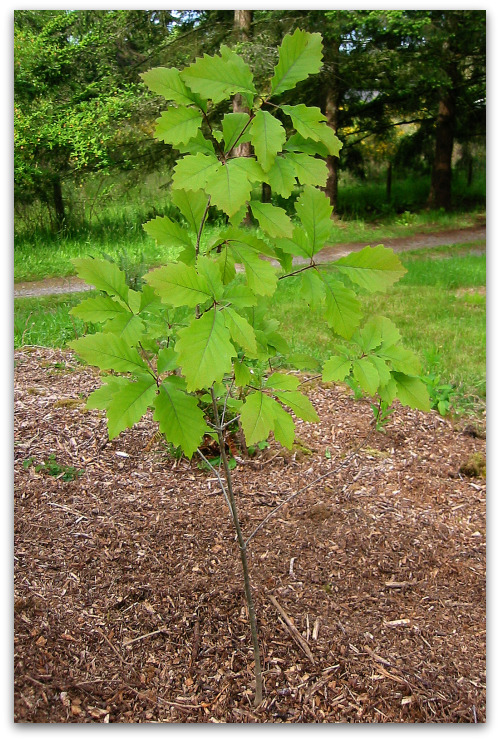 Getting ready to plant an unknown variety of oak, purchased at the Vashon Presbyterian Church yard sale. In the summer, I begin my morning with a walk about the property, coffee cup in hand, bulldog in tow, boots adrip with dew. Daylight does not suffer lazy fools in the Pacific Northwest or so my inner voice tells me. Dawn slips in early, dusk withdraws on its own accord. The day can be long, the rewards plenty, and the beauty inescapable. When the stingier months of winter arrive and darkness regains its throne, the rooks of rain move in to settle the score. My walk becomes an abbreviated stoop sit from the protected vantage point of a covered porch and a comfy albeit threadbare chair (cue the “Deliverance” soundtrack); but the coffee cup is still in hand, and the bulldog still in tow and the view no less comforting. Mighty and Mini: Little oak sapling dwarfed by a century-old black locust tree. No matter what the season, I greet the trees that grace my home property as often as I pass by them. Not with a verbal howdy do, but with a nod or delighted eye, or a smile or sense of wonder. I marvel that they even exist. Whether planted by islander, critter or determined gust of wind, they stand their ground, taking root and reaching for the rain and the sky and the stars, ready to bare witness to the shenanigans of the mere mortals beneath their boughs. Trees and I go way back, from my first squint skyward toward the loblolly pines and live oaks of South Carolina to the shaggy-barked, impossibly-difficult-to-climb pecan trees of my Alabama youth to the magnificent old-growth fir, cedar and spruce of the Pacific Northwest that often leave me speechless and in awe. Trees, like people, have stories, though most are untold and lost to the witnesses of time. I can only imagine what they’d say if falling leaves were falling words. The black locust trees flanking the north side of my house suggest the pragmatism of islanders over a century ago—opting for a tree with wood known for remarkable hardness, big BTUs, rot resistance, a blossom that beguiles any honeybee in a ten-mile radius, and a shade that filters light like a wispy cloud. I’m not sure if they intentionally planted the pair as perfect placeholders for my hammock, but I’d like to think that they did, and I thank them them duly with each swing or sway on a summer day. On the east side of the house, stand three colossal trees: one big-leaf maple and two madrones, or madronas as we say around here. A stark photograph from 1900, shows the maple tree at a height of about twenty feet, which makes sense as the house was about twelve years old at the time. Today it marks my property like a big, bold exclamation point in the front field. Big Mamma Maple in 1900, foreward and left of the house. In a swale beyond the south side of my house, a scrim of cottonwoods filters light through its quaking leaves and tangled scaffolds. Formidably tall and disproportionately lanky, the cottonwoods sweeten each spring breeze with blossoms seemingly scented with honey. My dear friend and neighbor Phoebe (some 90 years young) rerouted her walk each spring, just to enjoy the heady gift of the cottonwood grove. In late summer, winds tease the leaves to perform like softly clapping hands. The cottonwoods have begun to take their final bow, as three have already fallen to strong winds and wet ground. Even in ruin, the trees send up strong shoots from their massive trunks, and start a new chapter of growth. I may not be able to remember the names of childhood friends (or where I parked), but I can remember every tree I climbed in the front and backyards of my childhood homes. And for this nomadic Air Force kid, the tally was sizeable. As a teenager, I set up my getaway in our third-floor attic. Wavy glass pane windows were framed by the mottled limbs of stately sycamores lining our street like sentinels to the water’s edge of Chesapeake Bay. I was too old to climb trees (so I thought), so stairs provided me easy access to a treetop view. One’s daydreams have a place to soar when gazing through the canopy of a tree. One summer day about twenty years ago, I had the pleasure of spending a weekend on Lopez Island, in the San Juans. A morning walk led me into town to a smattering of Saturday market vendors. There on a listing card table sat a preponderance of pots with seedlings feeble enough to be overlooked, but not by this plant hound. Upon closer inspection, I was delighted to find one pot tagged “American Chestnut, Castanea Dentata.” The fellow plantsman and I gabbed about this uncommon and stately tree until my friends begged me to conclude the conversation and make way to the bakery. I obliged but with a potted chestnut seedling in my hand and a pocket shy of coffee money. When I cross the Sound to visit Seattle, I usually make a detour (if time allows) to drive by my former cottage of a house. On the sloped street near Green Lake Park, 57th and Ashworth to be exact, an American Chestnut grows with a vigor long denied its east coast cousins where blight decimated the tree’s range. Folks likely walk by the tree with little thought to its origin or why it’s there, but hopefully do delight in its beauty. Thanks to a weekend on Lopez Island, a rare and majestic tree found a new home on a prominent corner one block away from Seattle’s most popular park? The little cottage has been enveloped by plantings of fig, wisteria, maple, bay laurel and larch. And there on the corner parking strip stands the stalwart specimen of a once puny chestnut twig, now gloriously verdant, vigorous in habit, and prominently in place. Two decades later, the tree is (even though young) quite magnificent. May pruners, loppers and hacksaws never make its acquaintance, nor ruin the inherent beauty of its habit and framework of branches. I’ve planted many trees before. There’s something hopeful about the practice. While I know I may be absent for most its life, the world will bear witness to its growth, and vice versa. And the tree will continue to bring shade, fruit, flowers, and beauty to a spot once devoid of such endowments. I often feel that planting a tree is a way of saying thank you to life. Late spring green: Maple to the left, Black Locust to the right, cottonwood in the back, middle. Back on Vashon, I have several acres well suited for additional trees. For me, planting a tree is more joy than job. From gingko, to catalpa, to Chilean fire tree to fringetree, to an oak of many colors, I plant each one in hopes of seeing it grow and flourish and make its mark on the landscape and in the hearts of those who inhabit and visit this home. May one day a family share a picnic under its boughs. May a swing send muddy feet skyward, and a hammock slow things down for a weary weed puller. May fruit find its way to a basket and flowering branches to awaiting arms. When things seem a little hopeless, or sad, disappointing or without merit, a tree is a fine companion and a good listener, gently soothing the soul merely by its presence and proximity. Perhaps a hundred years from now on this very farm, eyes will look up through a vault of branches supporting the sky, and thank the soul, who it seems just like yesterday, planted a tree for someone else’s tomorrow. And maybe, just maybe, it will inspire that thoughtful soul to do the same. Love, love, love your writing Tom. Brings me great pleasure. Thank you. Hi to Buddy, my Bouvier Henri loves to hear about him. I love Madrona trees since I first met them when visiting Anacortes. You certainly have a way with words. Lovely, Tom! Thank you Susan, appreciate your kind words. Lovely story, Tom! You have such a beautiful way with words. I recall planting a tree with you at my west Seattle home over 14 years ago. It was such a great gift. Holy moly, was it that long ago? I see photos of the kids, and say it’s been way too long. Hope to see you in the coming year. I think nothing I’ve read since the election has moved or comforted me so. You’ve helped me both feel and remember that I am inseparable from the natural world, and for me that is all. Ah dear Amy, your words are balm for the soul. Be well, see you soon. Hi Tom, here I sit struggling with the writing of a letter to the Mayor and Council concerning a proposed community plan (gone awry). As required by officialdom, it has to be stripped of emotive words (anger! and frustration!) to leave a product impersonal, dull and dry. It’s a pleasure to switch track and read your beautiful piece about awesome trees. Now back to work. Thanks Mei, and here’s to your cause for good! May your words help them see the light! It is so heart warming to read your article. There is so much that trees give us in this life and it is delightful to read your delightful appreciation for our botanical friends. Apparently, they sleep at night, care for their own by their massive root system in partnership with fungi. What a lovely way to start this day. Thank you my dear friend for your perspective that soothes the soul during these dark times. You bet, and so glad to hear from my dear friend to the south. It was so much fun meeting you this summer. Even if I had not seen your home I can picture it by the wonderful descriptions you write about in your stories. Thank you for the words that inspire lovely thoughts and visions. Darcy, It was a pleasure meeting you this summer, too. And how did Jonathan luck out; he’s one lucky man. Thanks for your kind words and now new friendship. Warm regards. Such a delightful, poetic piece. This is the first thing I’ve read on the internet this morning, and it is well with my soul. Thank you Karen, your kind sentiment means a lot to me. This is beautiful writing that comes from beautiful thinking. Thanks. Teresa, I think I’m just going to bask in this comment for a few minutes before I head out to the chicken coop to let Casimir and his sister wives out. Thank you. Thanks for your lovely post, reminding me to treasure the “big” things in life when the little things threaten to overwhelm. Georgie says hi to Buddy. Buddy just gave a big thank you snort and slobbery hello to Georgie. And I’m delivering a less messy note, a thank you to you for your kind words. Hi Janou, so nice to hear from you. And I think David was a wise man to follow your request and his heart to north Idaho. What spectacular country, and dare I say you have a view that gives a glimpse of heaven. Well wishes to you and yours. What a beautiful property! Did you ever consider placing a plaque of some sort by the new tree (date of planting, your name, Buddy, etc.) for the people in the next century or two? Hi Carolyn, I have thought about that and may just place a little tag on the tree for fun, and I may even sneak one on the Ashworth Chestnut tree near Green Lake, too. Great idea, thank you. I’m headed right out now… will salute our black locust, thank the towering firs that stand sentry along our north boundary, and blow kisses skyward through the various acers scattered about our seven acres. Thanks you for opening my eyes this morning! And thank you for the lovely vision of your fine paradise. Another great post! I too am a victim of treelove, finding truly great trees often ignored in their neighborhoods, but sentinels of nobility, just the same. The madrone is called arbutus in Canada…arbutiful, to me. Do you know the blog of the Rowley Gallery in London? Wonderful entries, often about trees…take a look when you have time. Be well, only three weeks ’til the sun takes heed and starts to return! Hi Pat, oh what have you done. I just took a visit to the blog you offered up, and I can see my minutes, hours and days may be spoken for. 😉 I shall try to show restraint, so as not to sidetrack my productivity. Thank you for your kind words. Another fabulous post! I’m from New England and really miss the chestnut trees. Hunting for them with glee as a child and hours spent marveling at the smooth-as-silk oily grain! I’ve been reading about the ancient Druids – Tom, you must have been one in a former life! Their reverence and significance is wonderful! Thanks for sharing your passion and love for nature with those of us online. I recently found your website, and found it so informative….we planted a fig tree a few years back and it had a tough time during a very snowy winter… but this year it finally produced a few figs…12 exactly. Spring figs! I don’t know what kind of fig tree it is, but the figs were not very sweet…. will they be better next year? Good luck! And thank you. A beautiful post from a sensitive soul! We enrich our lives by really seeing and appreciating the beauty around us, and you have that talent in spades, Tom! Thank you Sandra, I am savoring your comment like a soft caramel chew. Thank you! Tom, I can only echo what others have expressed so well. Thank you so much for the splendid gift of what you have written and pictured. On the coast of extreme Northern California, we share many of the trees that grace your home. But oh, for a chestnut tree! And a black locust! Hi, Forrest. A few miles south. I have friends in Crescent City who have a son named Forrest. Oh Gosh, I forgot I asked you this! Thanks for letting me know. I am familiar with those towns, having driven through so many times. Very cool they named their son that! Thank you Stephanie. Can you believe I’ve never been to Northern California and its amazing forests. I look forward to it one day, to walk among the redwoods and be silenced. Well wishes. Epic post Tom! Great to see another from you, I was beginning to get Tall Clover Farm withdrawal shakes… and I now must add a comment to the already long list above, and say this one ranks up there among my favorites. Beautiful, beautiful writing, interesting autobiographical tidbits, great photos, a fine conclusion and a subject close to my own heart. My parents named me wisely, I’ve been obsessed with trees since I became a teenager, so this was very nice indeed. Forrest, your parents honored you duly with such a name. Here Vashon, some parents go a little overboard. I try not to act surprised when I meet someone named Bramble, Salal, Moonbeam or Sitka Spruce. 😉 Thanks for the kind words, Forrest, makes for a great way to start my day. Wonderful story and thank you so much for the photos along with it. We just moved recently from the Pacific Northwest (Kalama, WA) to Mississippi. Your photos make me miss it out there, but, even after 20 years out there we are still Southerners at heart (we’re natives of Louisiana) and it was time to come home. Still miss my morning walks and view of the Columbia and the beautiful trees. Hi Pamela, Thanks for the kind words and visit. Well the good news is you likely have some seriously beautiful magnolias, tupelos, and live oaks to enjoy in your new home state. And who doesn’t love a side of grits with their bacon and eggs. You can’t get that in the Northwest. 😉 Warm regards. Tom, You touched my heart. My mother taught me the things you were talking about. When you plant a tree it is not only for you but for those who come after you. Your are such a gentle soul. I am always uplifted every time I read your blog. Keep on sharing we need your perspective on life. Linda, and you kind comments touched my heart, thank you! The best part of writing this blog is the people. Thank you for sharing your memories and words of support. Cheers! That was so beautiful. It reminded me of every tree in my childhood yard. The large black walnuts and all the work they produced in gathering and opening up the nuts. Thank you, Susan. I love black walnuts and there are two huge trees about a mile from my house. I’ll have to take Buddy for a walk to see if the squirrels left us any of those hard-nuts-to-crack this year. Such a rich and unique flavor.